Land Rover has revealed list prices for its much anticipated Range Rover Evoque and the big news is that it will be available from just £27,995 - considerably cheaper than the Range Rover Sport and very close in price to the impressive Audi Q5. The new model goes on sale in September 2011. For your money you'll get the entry-level eD4 Pure five-door model which is two-wheel drive and has a six-speed manual gearbox. If you want the 4WD version it's only slightly more expensive at £28,705. The top of the range Si4 Dynamic three-door Coupe with the LUX pack (with a six-speed automatic) is £44,320. There's a choice of three engines in the Evoque range as well as two bodystyles along with the wide range of options you'd expect on a luxury model. The engine line-up includes an updated 2.2-litre diesel which is used in the Land Rover Freelander 2 and will also be fitted to to the Jaguar XF later this year. It comes in two versions - one with 150bhp plus a more powerful 190bhp. There will be a two-wheel drive Coupe version (due to go on sale in early 2012) which uses the lower powered version and as a result will emits less than 130g/km of CO2 according to Land Rover. Surprisingly there's also a petrol version in the shape of the new 240bhp 2.0-litre Si4 engine which combines direct fuel injection, turbocharging and twin variable valve timing for good performance and fuel-efficiency, with a claimed 0-60mph time of 7.1 seconds. 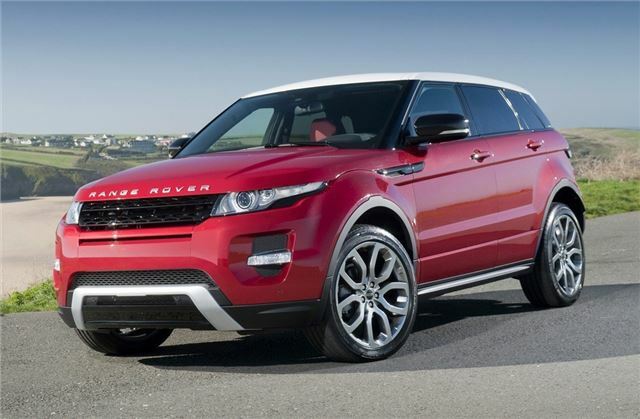 Unusually for an SUV, the Evoque comes in two bodystyles - a traditional five-door and a Coupe. The three-door Coupe has two individual rear seats, with the option of a three-seat bench while the five-door is the more practical choice with a higher roofline giving extra head and shoulder room for rear seat passengers. According to Land Rover, instead of the usual equipment trim levels you get on most cars, the Evoque will come in three design 'themes'. On top of that there's plenty of scope to personalise your car with 12 exterior paint colours, three contrasting roof treatments, seven alloy wheel designs, 16 contrasting interior and a full panoramic glass roof. There's now also an online configurator available here, so you can design your own Evoque. The design themes are Pure, which has a contemporary feel; Prestige, which majors on luxury and Dynamic, which has a 'bold and sporting character' apparently. The entry-level Evoque Pure is marked out by high-gloss black detailing across the tailgate with a dark 'Atlas' finish to the grille, front wing blades and bonnet louvres (on the Coupe). It also gets 18-inch Sparkle Silver alloy wheels while insider the seats are finished in grain leather with satin brushed aluminium trim on the centre console. Standard equipment includes heated front seats, an 8-inch high-resolution touchscreen display, climate control, an 11-speaker Meridian audio system with subwoofer, push-button start, Bluetooth, twin USB ports and cruise control. Handling and safety systems include Hill Launch Assist, rear parking sensors while 4WD versions are fitted with Hill Descent Control plus Terrain Response which can set up the vehicle for different off-road terrain. The mid-level Evoque Prestige has bright 'Atlas' detailing on the outside and 19-inch Diamond Turned alloy wheels while the interior has full leather upholstery which comes in a selection of warm and inviting colour schemes plus real wood finishers, tailored carpet mats and chrome tread plates. Metallic paint comes as standard along with xenon headlamps with LED lighting and front fog lamps. Other equipment includes an HDD satellite navigation system with dynamic route guidance and voice control option which displays 4WD information and can store digital music files. There is also a rear camera, front parking sensors and automatic headlamps and windscreen wipers. The Dynamic theme is designed as the sporting one and adds deeper body colour sills and bumpers, black-finished mirrors, grille and front wing blades plus 20-inch Sparkle Silver alloys giving it plenty of road presence. Inside there are aluminium pedal covers, a textured metal finish to the centre console and perforated leather around the steering wheel and (manual) gearshift. Dynamic models also come with Adaptive Dynamics featuring MagnaRide as standard for sharper ride and handling. Adaptive Dynamics is also available as an option for Prestige SD4 models at £1150. Many of the key technology systems available in the range have been brought together in a TECH Pack which includes HDD premium navigation system, a front parking aid, heated windscreen and windscreen washers, automatic headlamps, headlamp power-wash and rain-sensing windscreen wipers. It costs £1900 to the price of the Pure models. The LUX Pack for Prestige and Dynamic models offers greater convenience, on-board entertainment and safety. It introduces the following items and costs an extra £4325.